364 pages | 1 B/W Illus. 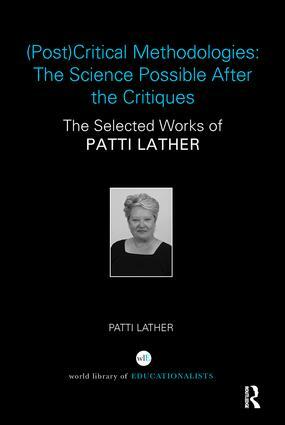 (Post)Critical Methodologies forms a chronology through the texts and concepts that span Patti Lather’s career. Examining (post)critical, feminist and poststructural theories, Lather’s work is organized into thematic sections that span her 35 years of study in this field. These sections include original contributions formed from Lather’s feminism and critical theory background. They contain her most cited works on feminist research and pedagogy, and form a collection of both early and recent writings on the post and post-post, with a focus on critical policy studies and the future of post-qualitative work. With a focus on the implications for qualitative inquiry given the call for scientifically based research in education, this compelling overview moves through Lather’s progressive thoughts on bridging the gap between quantitative and qualitative research in education and provides a unique commentary on some of the most important issues in higher education over the last 30 years. This compilation of Lather's contribution to educational thinking will prove compelling reading to all those engaged in student learning in higher education worldwide. Patti Lather is Professor Emerita at Ohio State University, Department of Educational Studies, where she taught qualitative research, feminist methodology and gender and education from 1988 to 2014. She is the author of four books, has lectured widely in international and national contexts and held a number of distinguished visiting lectureships.